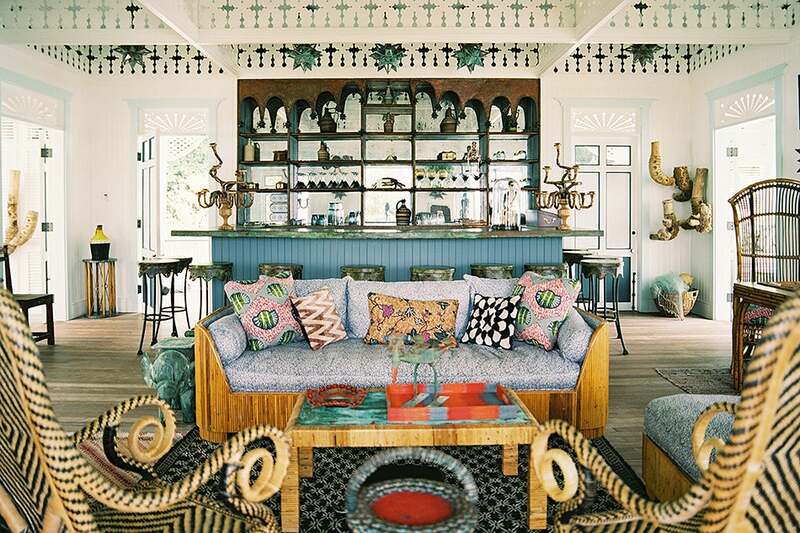 New York-based interior designer Celerie Kemble has brought a diverse array of aesthetics — from Caribbean to Continental — to bear on one of her latest projects, the Dominican Republic resort Playa Grande Beach Club (portrait by Hannah Thomson). 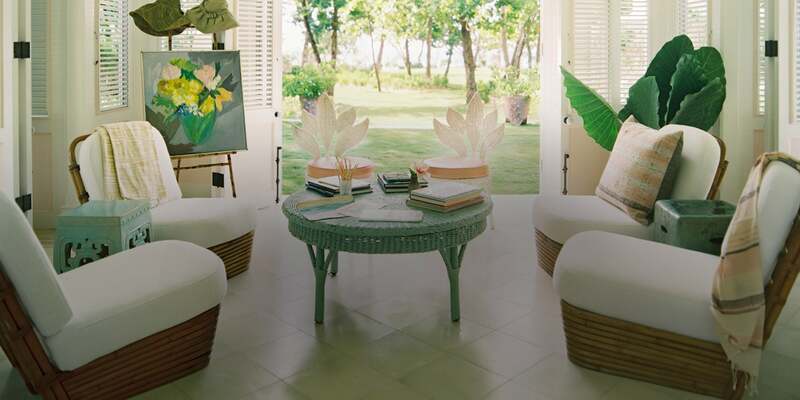 Top: Indoor-outdoor living on the veranda of one of the hotel’s bungalows. 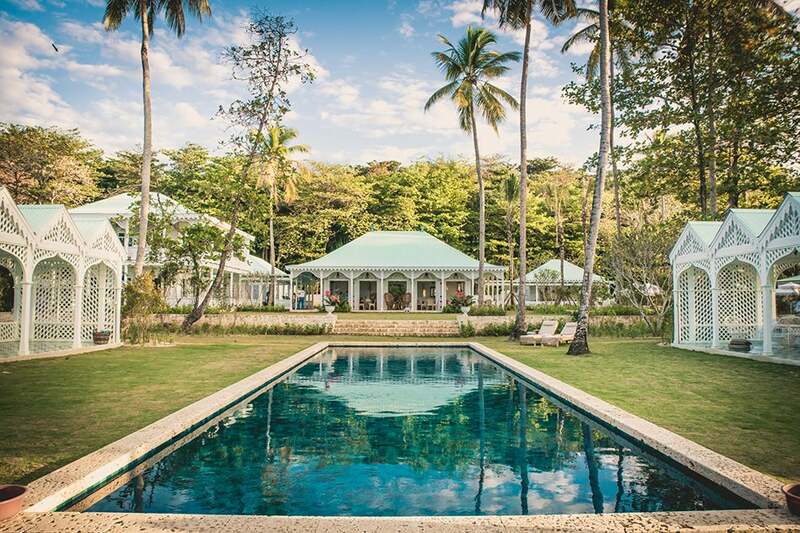 Long the holiday haunt of such high-flying aesthetic arbiters as Bunny Williams, John Rosselli and the late, locally born Oscar de la Renta, the beaches of the Dominican Republic are no stranger to bold-faced names. The Caribbean island nation’s relatively undeveloped north coast, however, has enjoyed a comparatively quiet existence. 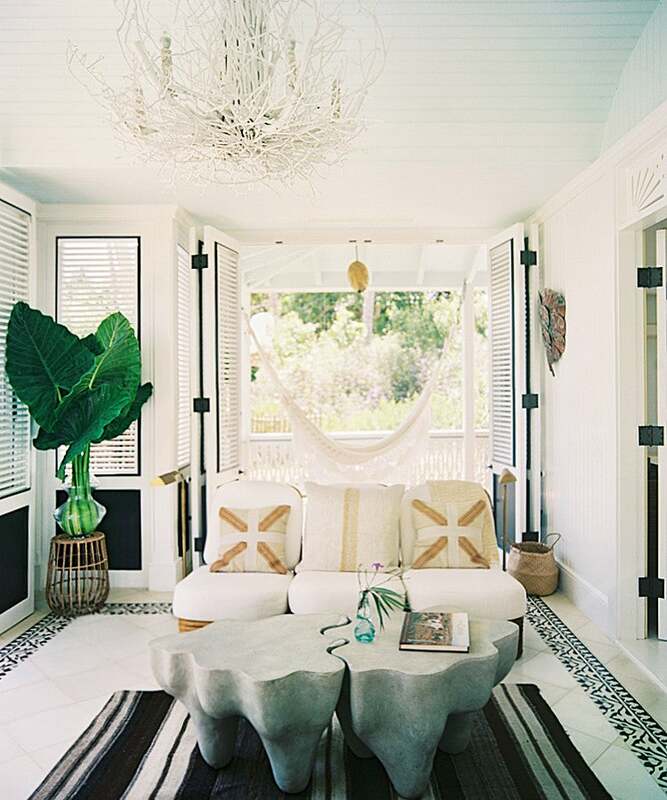 And so, when interior designer Celerie Kemble — who grew up in Palm Beach and lives in New York — and her money-manager husband, Boykin Curry, found themselves with the opportunity to acquire about 2,000 acres of pristine waterfront wilderness here, they jumped at the chance. Assembling a group of worldly and wise friends and investors that includes actor Mariska Hargitay, architect Richard Meier and intellectual interlocutor Charlie Rose, Kemble set about creating a beachfront fantasy of cabanas, bungalows and country club-style amenities and facilities that finally — after a 10-year gestation — opened this winter as Playa Grande Beach Club. Now, its six one-bedroom and three three-bedroom residences, each privately owned but all decorated by Kemble herself and designed in collaboration with local contractor-builders Zolucione, are available for vacation rental, operating as a casual-cool, petite luxury resort that feels as much like a home as a hotel. Hand-wrought Victorian-inspired woodwork adorns the double-decker wrap-around balconies of the building housing Playa Grande’s library and Star Bar. Here, Kemble shares some secrets of Playa Grande’s successful signature visual appeal. 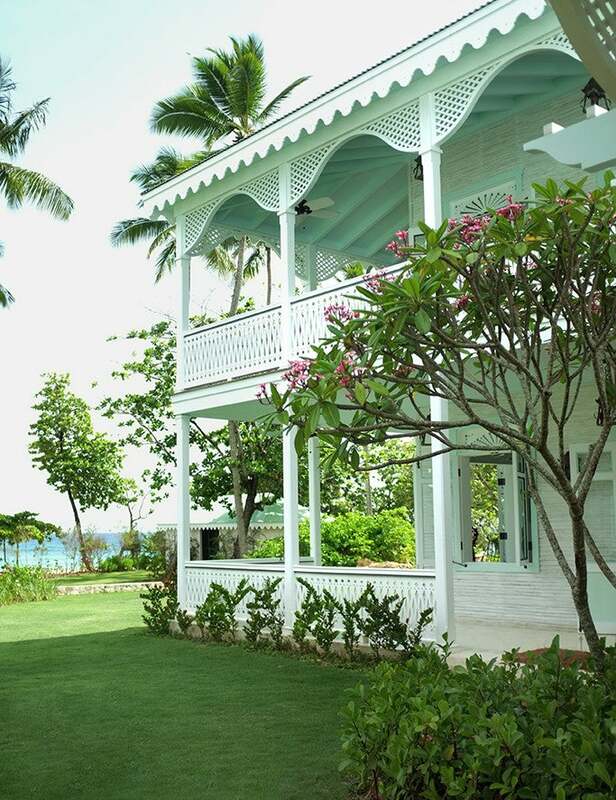 Louvered-shutter doors fold open, accordion-style, connecting a sitting area of the minty-green Minta bungalow to the surrounding jungle landscape. A Dominican friend of mine, the late Delio Gonzalez, introduced us to the property. Our first sight of the beaches — framed with wild jungles, nestled between staggering coral stone cliffs — inspired a passion project that would eventually involve about 20 friends and investors, and take, to date, more than 10 years to build. Our intention was to construct a small beach club and hotel, plus beachfront and jungle houses, siting them with generous easements so the property would be walkable and accessible to all. We wanted to keep the beach open to the public, to integrate the property with the culture of the local towns and to let the wildness of the setting dominate anything we built. We were all excited to find something so indescribably beautiful but within easy reach of most of our East Coast home bases. 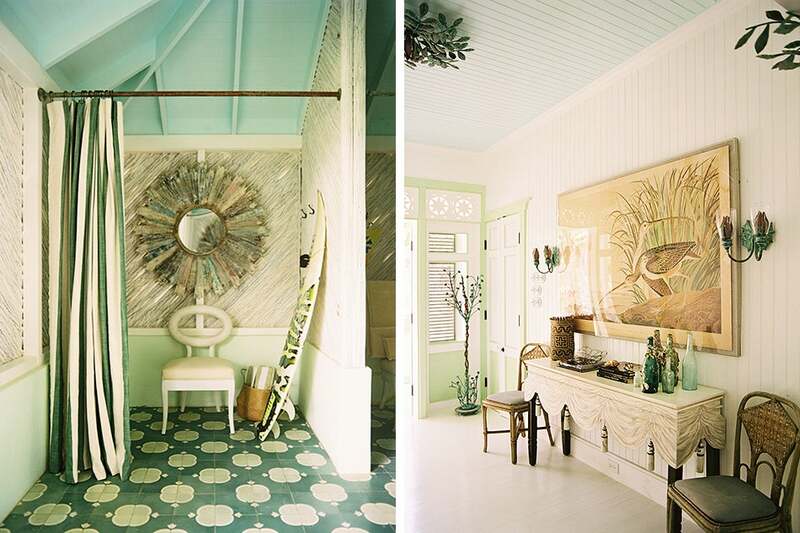 The color scheme is dominated by faded-bathing-suit pastels, conch shell pink and bright-sky aqua. 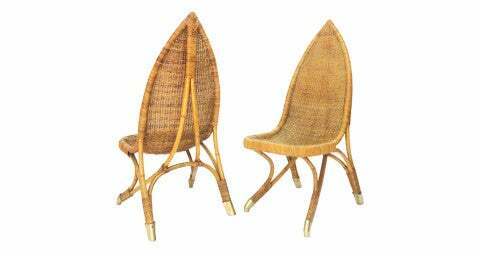 Our furniture is soft and ladylike or abjectly kooky — many shapes are from the 1930s through the ’60s, and most are in natural materials: cane, wicker and reclaimed tabla de Palma (split royal palm wood). The one-bedroom bungalow called Arena — one of Kemble’s favorites — has a black-and-white color scheme that carries through from the handmade tiles to the millwork. 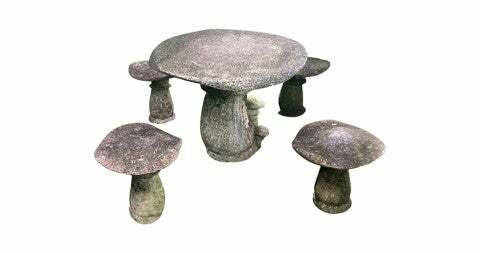 The contemporary coffee table is made of concrete resin. Almost everything — all the woodwork and all tiles — has been handmade by local artisans or is vintage, so nothing is perfect. The humility of this imperfection and gentle dilapidation make the spirit of the club and adjoining houses gracious and freeing. Given that we are not developers and were working in a foreign country, and that the property is owned by a medley of friends, all with slightly different dreams and only occasional full attention for the project, the process was an Everest-sized learning curve for almost everyone involved. We thought we would be up and running in three years! 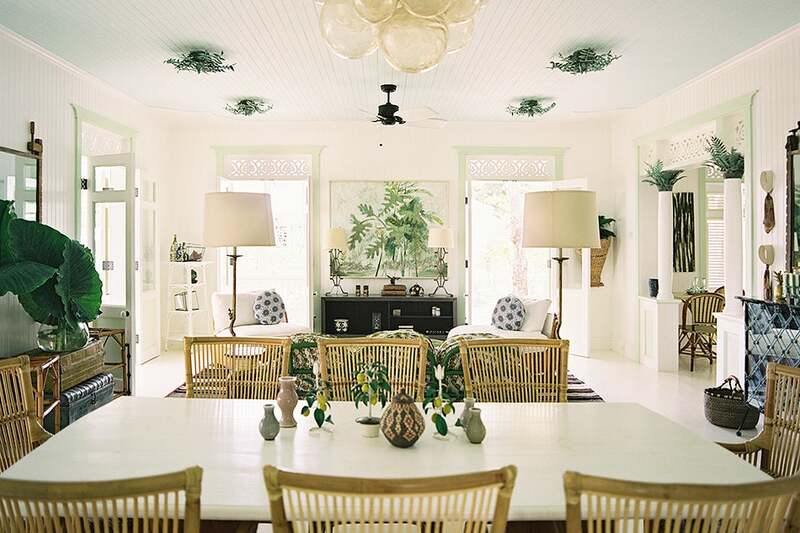 In the Carambola bungalow, a dining table surrounded by cane-and-rattan chairs gives way to a living area beyond. A kitchen sits through the columned opening at right. Left: Kemble showered every corner of the resort with attention, even the changing room of its pool cabana. Right: A vignette in the Cielo bungalow features a GuildMaster console table and Natural Curiosities print framed in Lucite. 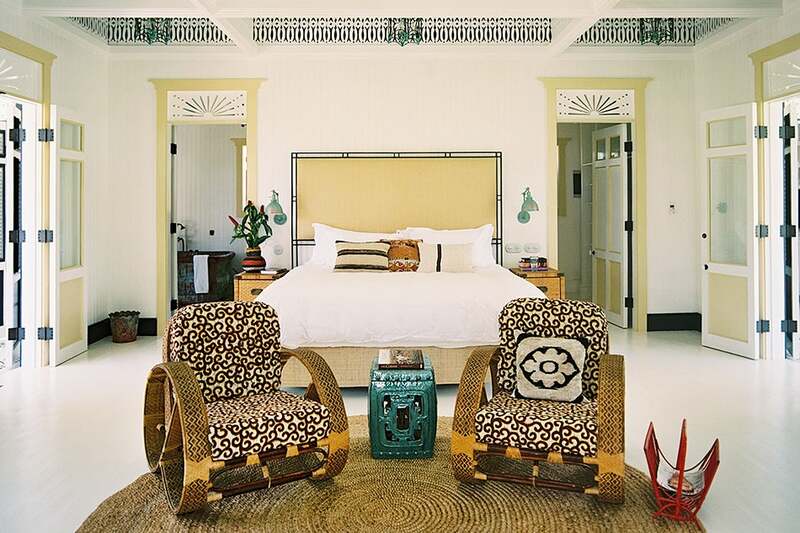 In the bedroom of Arena, the black-and-white scheme incorporates golden tones, not least of all in a pair of vintage chairs with braided-rattan arms. Open-front, gingerbread-trimmed cabanas surround Playa Grande’s pool. Pastels in a variety of hues, patterns, prints and textures mix and match in Cielo’s living area, whose influences seem to hopscotch the globe from Europe to Morocco to India. 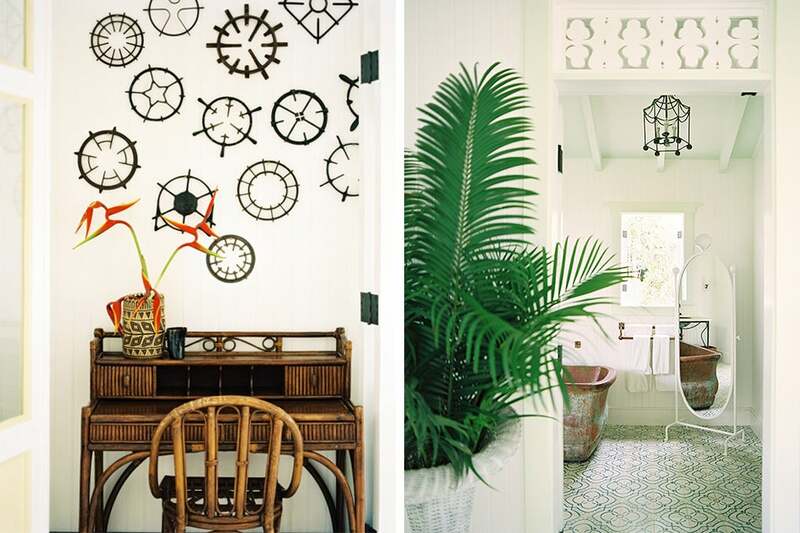 Right: A collaged constellation of compass-like vintage stove trivets hangs above a cane desk in Arena. Left: The bathroom in Minta features the same deep copper soaking tub found in all the bungalows. 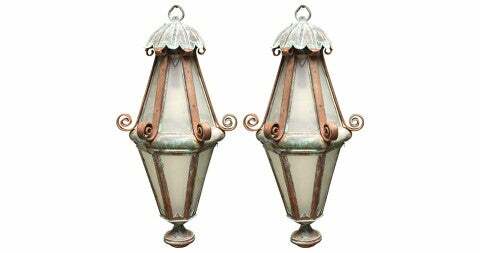 Kemble adorned the Star Bar with copper-and-glass celestially inspired light fixtures crafted by a local artisan. 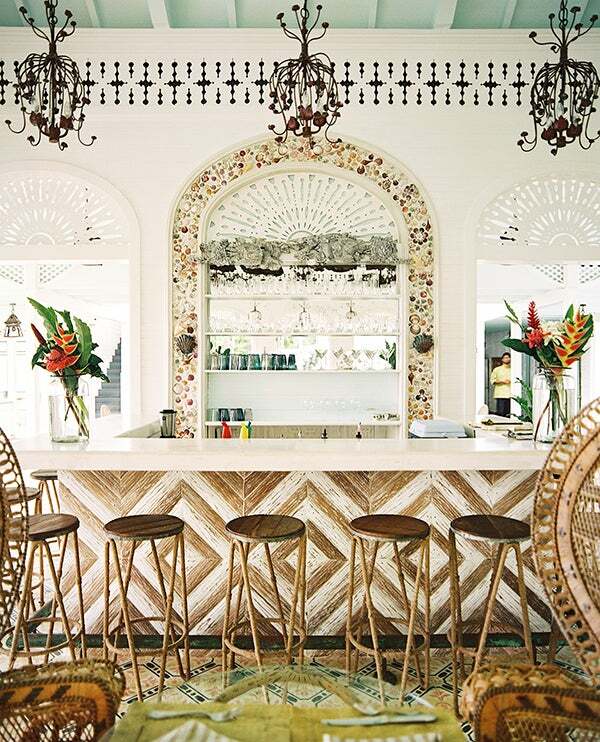 In Playa Grande’s main bar — where hand-set seashells frame an otherwise-unassuming archway — a riot of highly tactile textures and patterns are tamed only by Kemble’s tasteful touch. Our Star Bar light in the upstairs bar consists of 32 different stars, some made of glass and copper, some just perforated copper, all created by a local craftsman named Neno. We hung each one separately, which involved eight long hours of climbing on the bar and moving around the room to place each fixture in the right spot. 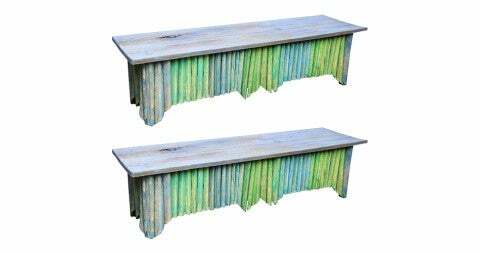 I have set-backdrop paintings of cabanas in my beach house here, which were done in France in the 1930s; I found them at Ellen Ward Scarborough Antiques. 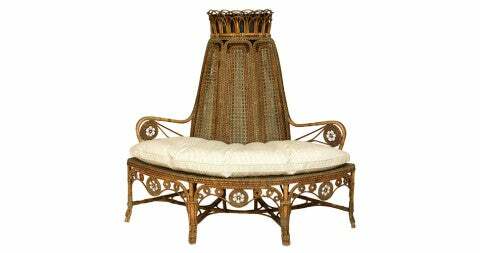 And then we have two sets of Belgian metal-framed chairs: There are 1920s rockers from AWK Design Antiques on the porches of the library and bar, and then a pair of more contemporary, 21st-century garden chairs from Architectural Anarchy at my place. For the seashell arch in the main club room and behind the bar, we essentially sought to make a sort of lace with shells, some of which we found here and others we bought. My assistant and I collaborated through text messages and email pictures to find the right patterns, working with her in the DR and me in the States. We hand-set each shell in the wet concrete. It was more hands-on than high-concept, and our fingerprints are all over it — both literally and figuratively. In the bedroom of Minta, a nearly all-white scheme sets off the deep mint-green Kemble used for the ceiling alcove above the bed. That’s like asking a mother to pick her favorite child! I would say either the one-bedroom bungalow Arena, which is our all black-and-white place, or Cielo, which, like each of the three-bedrooms, has an adjacent one-bedroom that can be added on as a separate master suite. (The three-bedrooms are ideal for families, and the one-bedrooms for couples.) But my absolute favorite is Minta, the one-bedroom closest to the library. The pale, powdery mint-green colors are so bright and clean. There are some concrete lambs that we move around the club at night, so guests wake up to find them in different and surprising locations every morning: grazing here, up a tree there. 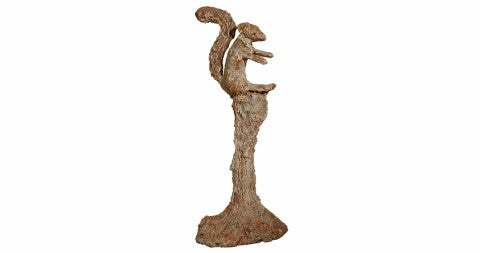 I couldn’t stop buying concrete animals, actually — lions, zebras, pigs, frogs, flamingos — and they’re all over the plantings. Only a child has the attention span to find them all, though. You have to be down low and on the hunt. We have a large copper soaking tub in each bungalow that can fit a family of five. You can soak in it all the way up to your shoulders and coax sand from even the sandiest places. With family roots stretching back five generations in Palm Beach, an Ivy League education and a fabulous New York apartment with Central Park views, interior designer Celerie Kemble brings no shortage of pedigreed polish to her projects — but she balances that sheen with a relaxed elegance enriched by whimsical finds, rich colors and warm textures. 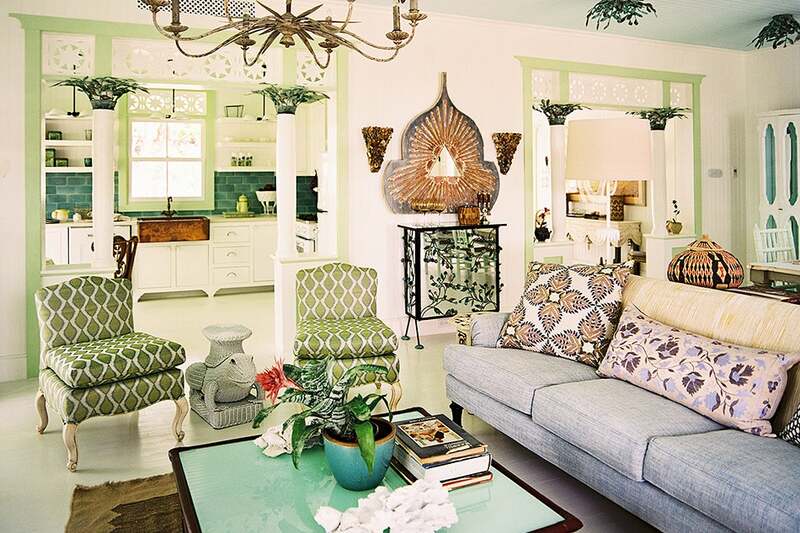 Taking a detour from a planned career in fashion to join Celerie Kemble’s interior design team, the New York–based decorator Sara Gilbane — who launched her own firm in 2008 — has earned accolades for a bold, whimsical aesthetic that mixes old and new, silly and serious, and combines it all with a healthy helping of color.